COME AND SPEND THE DAY OFF SCHOOL AT THE MARITIME MUSEUM OF BC LEARNING ALL ABOUT SHIP LIFE! Come and spend the day off school at the Maritime Museum of BC learning all about life on board a ship! Join in while we learn about shipbuilding, navigating using a compass, and do some ship-themed art. 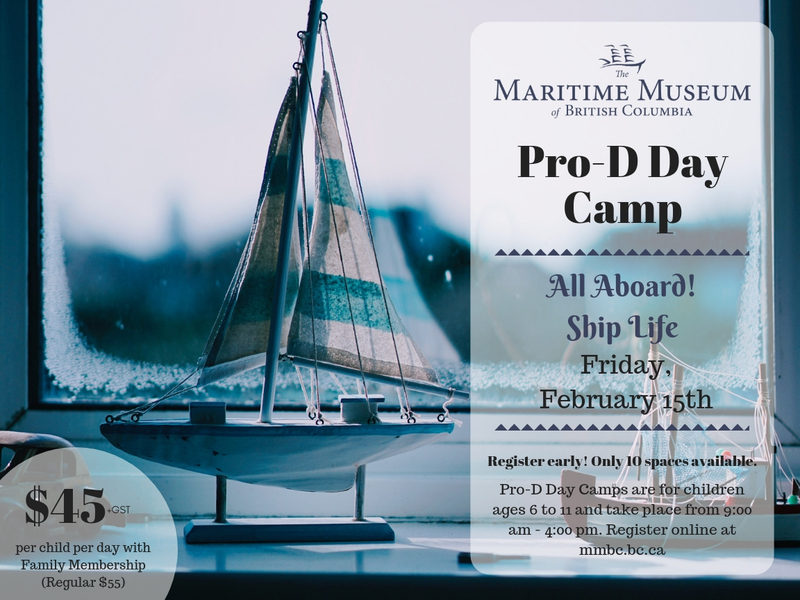 Our Pro-D Day Camp runs from 9:00 am to 4:00 pm on Friday, February 15th and is for children ages 6-11. Space is limited to 10 children, so register early! Although snacks are included, lunch is not. Please ensure your child comes with a packed lunch. Some activities will be outdoors. Weather-appropriate attire is required. Drop-off is at the Maritime Museum of BC (634 Humboldt Street, Victoria BC) between 8:45 AM – 9:00 AM on Friday, February 15. Pickup is at the Maritime Museum of BC (634 Humboldt Street, Victoria BC) between 4:00 PM – 4:15 PM on Friday, February 15.